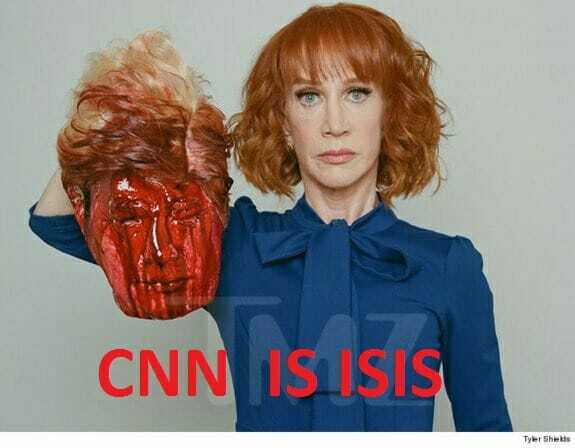 Kathy Griffin announced that she was terribly sorry for the video released today of her holding President Trump’s beheaded and bloody head. Kathy Griffin calls this eyeroll filled video an apology? But this was not her first response to the Trump beheading video. She posted 2 tweets first that she later deleted. In her first tweet she makes fun of blood coming out of the President’s head in her video and in her second tweet she mocks the President. Many are astounded that CNN took so long to reply to the incident and still has plans to keep Griffin on board. In other words, CNN took 8 hours to issue tepid statement, refuses to fire Kathy Griffin. Donald Trump, Jr asked Anderson Cooper of CNN if he will work with her if she (Griffin) is back on the air. Many are now comparing CNN to ISIS as a result of their representative showing a video of beheading the President. The Democratic Party = ISIS, they are beginning to the same! the pictures are no difference!